SCARY #5 - Summer Special - The Body Snatcher and more! 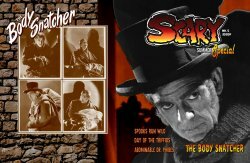 MyMovieMonsters.com > Scary Monsters Magazine > > SCARY #5 - Summer Special - The Body Snatcher and more! After a three-year hiatus, this officially is the Summer of Scares as we introduce SCARY No. 5. Very limited production and not available at bookstores or comic shops. This Summer Special is for you, whether you are a Scary Monsters reader or are new to our scary corner of the world. We're celebrating the classic horror and sci-fi motion pictures, directors, actors, writers, and monster makers responsible for giving us thrills and chills for generations. Every issue of SCARY pays homage to vintage monster magazines and filmbooks that featured the trailers of favorite fright films, brief reviews, and current and ghoulden age comics with a ca-coffin-y of images that are both fearsome and fun. In this issue we highlight some of the motion pictures, movie stars, and guests on the scary schedule for Monster Bash 2018, including Brandy Gorcey, daughter of Leo from Spooks Run Wild and Ghosts on the Loose, Janina Faye of The Day of the Triffids, Sharyn Moffett of The Body Snatcher, and Victoria Price, daughter of Vincent. We also introduce a scary tale from Kevin Glover's Monster Smash-Ups #1 from his line of comics by Fractured Scary Tales Publishing. We have issues 1-4 of Fractured Scary Tales and more to come available for order on this website. Scary Monsters readers will recognize Rick "Spine" Mountfort's crazy and silly Frankenbilly, whose high-powered hooch leads to a whole new level of arachnophobia for Beaver, Granny, and the backwater gang. And, finally, we turn the scary pages back to December 1954 with the devilishly spooky story "Payment in Full!" from the classic comic Amazing Ghost Stories. So, get your 10-gallon drum of pennies out that you've been saving up as it's just 2,000 cents! Also includes Scary Word Search, movie trailers ... and much more! Perfect-bound, glossy soft-cover book. Color cover and 80 B&W inside pages.Published June 2018 by MyMovieMonsters.com.